This one snuck up under the radar for me, and was a real pleasant surprise. Upgrade is a Blumhouse Productions film made by some of the same people who make Insidious, The Purge, and Saw, so the previews didn't really sell me on the idea of a clever sci-fi thriller. I was expecting more of just a gore-fest. There's some really over-the-top violence and gore, but the movie is paced well enough that every single graphic kill feels legitimately earned. The choreography is exceptional and creative, and might have been worth the ticket price alone, even if it weren't attached to such a well-made movie. 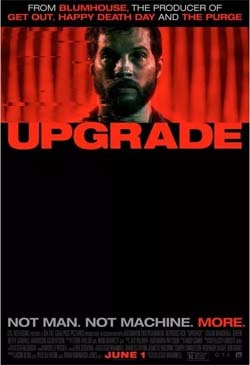 Where Upgrade surprised me, however, is the way that it is filled with small world-building details that really help to sell this idea of slightly-dystopian near-futurism, and the almost luddite level aversion that some people might have to the inevitable automation of our lives. It does this by being a small, simple story that has a sinister undertone, but which doesn't feel like it's trying to be too grandiose or overblown. This is basically a hard-R-rated feature-length episode of Black Mirror. Upgrade has some very slick choreography, and some gruesome (but well-earned) violence. Sony unveiling PS3 Slim(mer). Should I care? It is being reported that Sony is planning on releasing a slimmer version of the PS3 console this holiday season. I have yet to see any detailed technical specs of the new unit other than that it will be lighter and smaller than the existing PS3 Slim models and will have a bigger hard drive out-of-box (250 gig or 500 gig models will be available). I don't really see the point in this move; although, I guess if the lighter, smaller unit is going to cut production costs, then it's a smart business move for Sony. But from the consumer standpoint, I don't see any reason why someone would want or need to "upgrade" to the new model. Maybe they'll release additional technical specs at the upcoming Tokyo Game Show?